We expect of our jurors and judges calm, reasoned evaluation of the evidence. Of course we know the reality is rather different - prejudice and emotional reactions will always play their part. Now two new studies add insight into the ways people's legal judgements depart from cool objectivity. Beatrice Capestany and Lasana Harris focused on two main factors - the disgust level of a crime, and whether or not the perpetrators' personality was described in biological terms. 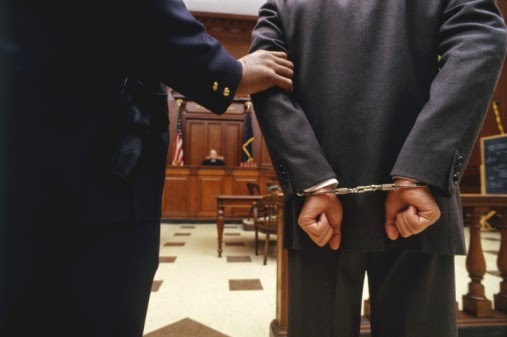 Seventeen participants were presented with pairs of crime vignettes, with each crime in a pair matched for severity in terms of US Federal sentencing guidelines, but one crime high in disgust value, the other low. For example, one vignette described a man pulling a gun on a love rival, taking aim and missing. The matching vignette described a man who stabbed his boss with scissors, once in the neck and once in the back, causing serious blood loss. Each vignette concluded with a personality description that was either trait-based (e.g. Gerald has an impulsive personality) or biological (e.g. Terry has a gene mutation that makes him impulsive). These contrasting personality descriptions were always irrelevant to the crime - so, in the aforementioned impulsivity examples, the crime in question was pre-meditated. Capestany and Harris found that participants recommended more serious punishments for crimes that were more disgusting. This sounds like emotion clouding judgment. But in a sense, greater disgust made participants more reliable decision makers because when disgust levels were high, the participants' recommendations more closely matched Federal sentencing guidelines. Perhaps, the researchers surmised, this is because the US legal system is rooted in historical moral judgments that were guided by disgust reactions. When it came to the influence of the personality descriptions, participants judged criminals to be less culpable when they'd been described in biological terms, presumably because biological factors are perceived as deterministic and reduce the sense that the criminal has control over their behaviour. The brain scans showed greater recruitment of logical reasoning centres when vignettes included trait (non-biological) descriptions of the criminal's personality, so perhaps participants jumped to conclusions when given biological information. "Biological personality descriptions dehumanise the person, reducing them to a mechanistic, biological organism and not a human being whose mental states are highly unique and salient during responsibility judgments," the researchers said. Another way that a suspect can be dehumanised is by describing their actions in animalistic terms. This is what happened in the the UK with the real life case of Raoul Moat in 2010, after he shot three people in England. He was described in the media as a "brute" and like "an animal in the wild" when he went on the run. A team led by Eduardo Vasquez has investigated people's sentencing decisions when criminal acts are described in animalistic terms (e.g. "... the perpetrator slunk onto the victim's premises ... He roared at the victim before pounding him with his fists") versus in non-animalistic terms, but with wording matched for seriousness (e.g. "the perpetrator stole onto the victim's premises ... He shouted at the victim before punching him with his fists"). Vasquez and his colleagues said their results "add to a growing body of literature examining the consequences of dehumanisation". They admitted that the implications for actual trials are unclear - after all, the descriptions they used are rarely heard in court. Nonetheless, they said there could be real-life relevance: "Media reports influence legal proceedings and most people rely on the media for information about criminal justice... People exposed to these [animalistic] descriptions may vote for harsher policies to address crime."